The Dawn Wall of Yosemite’s El Capitan is the biggest, steepest, smoothest cliff in North America. For the last four years, Tommy Caldwell and Kevin Jorgeson have been engaged in an epic quest to free-climb this three-thousand-foot sweep of granite, meaning they hope to ascend by pulling on rock alone, never on gear, and with ropes employed only to catch a fall. For months at a time, Caldwell and Jorgeson have journeyed up and down the Dawn Wall rehearsing the hardest sections hundreds and even thousands of times, struggling to master intricate moves on dime-thin holds. Now these two men are sixteen days into what they hope will be their final three-week effort, a bottom-to-top push — sleeping in portaledges, high off the ground — in which they’ll free-climb the entire route in a single go, and thereby claim the official first ascent of what is unquestionably the world’s hardest rock climb. Caldwell briefly spoke to us by mobile phone from his portaledge during a moment of rest. It’s really cold down in Yosemite Valley because the valley’s in shade. But up here, it’s eighty degrees. This part of the wall is incredibly solar at this time of year. I’m about to take off my T-shirt and bask in the sun. Actually, it’s too warm for these tiny little holds. We have to climb at night when the rock’s colder so our fingers stick better. 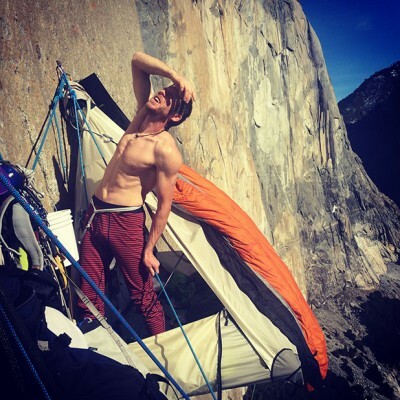 Tommy Caldwell taking a “healing day” on the Dawn Wall Monday. But how do you see tiny hand-holds at night? This wall is so blank that it’s actually harder to see the holds in the daylight. You have to have your face like six inches off the rock to even tell they’re there. At night, the headlamps reflect off the edges, so it’s easier. Have any big winter storms hit, since you’ve been up there? Well, the third or fourth night there was such high wind they had to close all the roads in Yosemite because of downed trees. Luckily, we had our portaledges anchored to the wall at all four corners so we didn’t get airborne. There’s been ice chunks falling off the wall, too. But not big ones. Mostly I just want to stick out my margarita glass and fill up.